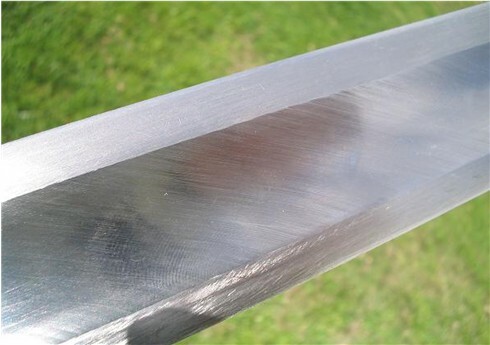 The Hanwei Practical Viking Sword was an economical and extremely tough beater designed to withstand the rigours of Viking Re-enactment. A real shame this basic, but well made sword was discontinued. One of my hobbies is modifying my swords. I also like a tough-as-nails beater which doesn't cost much. We are probably all familiar with Hanwei's Practical western line. I already have experience turning my Practical Hand and a Half into a sharpened beater, and wanted a light and quick single hander to sharpen. I chose a previous generation SH2047 Practical Viking. I chose this over the SH2046 Single handed knightly sword as the profile of the blade looked to lend its self to sharpening better. The ridges of the 2046 may have been destroyed on the grinding wheel. Also I hunted down an old model Viking as they dont have those side fullers which probably would muck up the side bevel. Also the fullers go too close to the tip and would stop a nice carve of the tip. My First impression was that the sword was surprisingly light and flickable, and once flicked I realised that the pommel dug into the palm of my hand badly at the end of a swing. For that I would need to get used to a handshake grip. 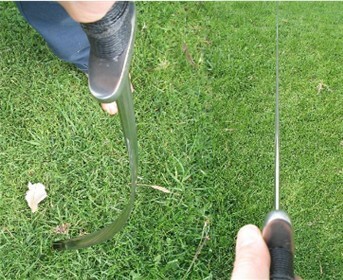 The blade is very flexible when pushed, yet still quite stiff when shaken. Though not stiff enough for serious thrusting. Overall length is bang on 900mm / 35 1/2". 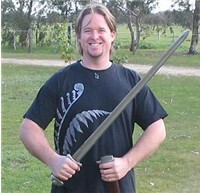 Blade length is 760mm or 30". 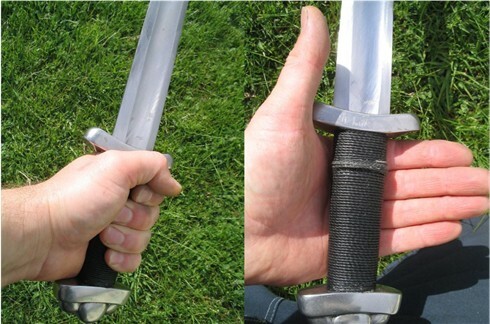 Grip length is right on 100mm, or just a hair under 4"
The POB on the sword is about 140mm (5 1/2 ") However once sharpened this came back to 110mm (4 3/8"). The blade bias to the balance is quite welcome as the sword is so light, it assists the cut. Yet even at 110mm POB and so light, its very nimble to wield. Weight: this is cool. I didn't measure it blunt, but now it's fully sharpened it is only 880g (1lb15oz)!!! This makes for a sword that is so light and easy for me to wield. I am used to 3lb plus hand and halfs, now I really notice their weight after using the viking. The brochure lists it at 2lb2oz (which I think is 960g). On the short side it provides a snug but comfortable fit to one adult male hand - just as well it is so light as there is no hope for hand 2. However the top hand can be used on the blade to great effect. My hands are large but not XL. The leather was well glued, straight and tidy. It provides a soft, comfortable feel. With a hammer grip the pommel digs in at the end of a swing as you try to stop the momentum. 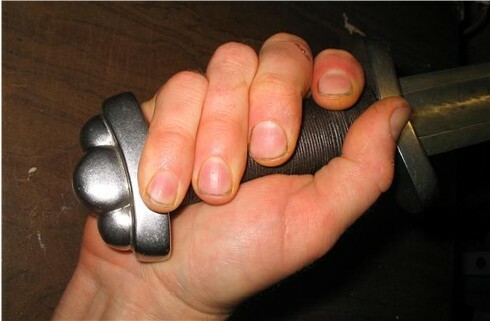 A hand shake grip is used. The addition of a riser has given me something else to pull back on and makes me feel more secure as I get used to the handshake grip. More on the cord wrap later. The standard leather wrap is very comfy, but I like to customise - it's really aesthetic for me. 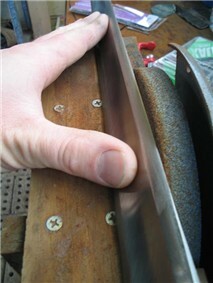 The finish of the fuller is not perfect and has very obvious grinding marks. The bevel is very neat and shows very faint traces of forging. The 1/16" edge is very square and is not precisely the same through the length of the blade. The blade is very straight but again not perfect in its grinding. For the price I think this is acceptable. The pommel and cross are very firmly attached and there is no hint of any rattle or movement. They are cleanly cast and polished, then epoxied in place. Construction of the hilt furniture is Stainless steel. It looks very nice but mine was far too loose fitting. You can wobble the sword around inside. Also there is nearly no tightness holding the scabbard on, it wont hold its own weight at all, and from about 20 degrees below horizontal the sword will just slide out. Peening of the tang also shows the hammer marks, but for what this sword is intended for, thats acceptable. It's not pretty. What's great is that this is a peened full tang with no welds, where as the functional version has a welded threaded tang, which would not interest me. Say no to welds. Yes this is designed for re-enactors, for steel on steel contact. As this is not my field I can't comment on this (safety, steel on steel), but I can attest to the flexibility, temper, and toughness of the steel. But this is what I bought it for  to make it functional. When sharpening my hand and half I spent 4 hours putting a 30 degree bevel on it with hand files. I blunted 3 hardened steel files in the process and only sharpened half the blade. No fun, lots of sweat. Also the 30 degree bevel on such a thick blade was too steep for great cutting. I wanted to get a single bevel right from the fuller ridge to the edge. So I built a wooden jig for my bench grinder (finer side wheel) to support the sword and eliminate any chance of the stone grabbing the blade and jamming it down the side. I hooked up a bottle with a hose and a tap on it to drip onto the stone, in the hope of keeping the operation cool. It does spark when it grinds, and will change colour if the metal is very thin. But on the main bevel the sword wouldnt go over 30 degrees Celsius (app. 90F - warm to touch but not at all hot), and doesn't change colour. My temper concerns were unfounded as the above flex test was after sharpening. Before grinding I made sure that any gaps where the blade entered the cross were sealed with epoxy to halt water ingress. Another tip is to smear waterproof grease at the base of the blade, and around the tang peening to avoid water ingress. I run the blade down the full length on each stroke holding as below. Ill do about 20 or so runs on one side then change over. Working only on one edge. Youd have to stuff up big to damage the blade because it takes nearly 2 hours of this just to get one side down to a sharp edge. Beware as the edge gets fine as it can overheat real quick. The key is to keep it moving, long strokes, to avoid any heat build up. That also stops you taking much meat off in a hurry. Then I finish it up on a hand held oil stone to polish out the grind marks and smooth the edge. I cant stress how slow and time intensive reducing this steel is. This steel is sooo tough. I press the blade in place on the stone at about 10 degrees (nearly flat to the stone). It ended up with a nice smooth, even bevel from the fuller to the edge. I tried to catch it on photo but its hard to see. Also I leave myself a blunt Ricasso on my swords for 2 handed thrusting (moot on this sword), this shows the standard blade edge. I will cord wrap the Ricasso soon. I cut off the leather wrap and wrapped the grip in black cotton, later replaced with brown cotton (imitation leather cord) to suit my taste, and added a riser to assist grip. Since getting a perfect single bevel ground from the fuller to the edge (on the second grinding session) this has been a very capable little cutter. It is so light and nimble and has sliced some 1 1/2" Eucalypt branches like butter. It's a fine axe, but I still find it a little hard to control with the handshake grip. Luckily I left a Ricasso of blunt blade because with a two handed grip I have found it very capable of slicing right through the toughest bottle tests with little resistance. I've acid etched some Nordic Runes from the elder futhark into the fuller.